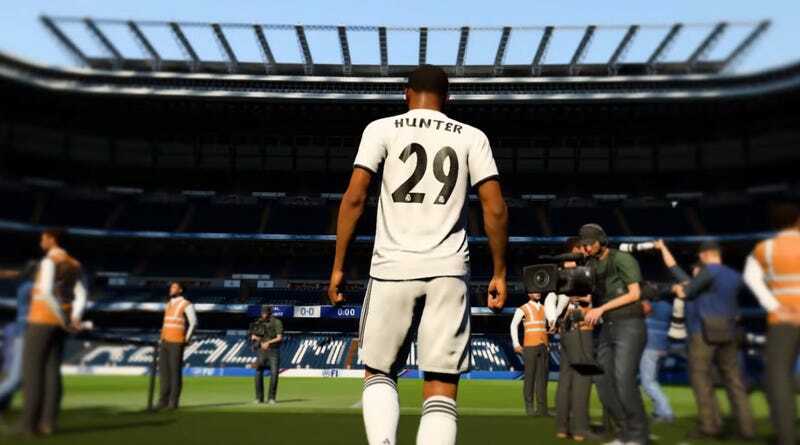 Real Madrid, a very real and historic football club, have this week started selling the jerseys of a very fake player: Alex Hunter, star of FIFA’s singleplayer story mode. Having built up to it last year with a false start and some loan deals, this year’s game finally has Hunter signing with one of the biggest teams in the world, the defending Champions League winners. Seems harmless, right? Well, time for some context. The loss this summer of manager Zinedine Zidane and star man Ronaldo—who has moved to Juventus, in Italy—has fans sweating. Their rivals in La Liga have been making signings to reinforce and strengthen their squads. Real? They’ve bought a goalkeeper and...well, are now trumpeting this Alex Hunter thing like an actual player contract. That says “our new signing in action”. I think it’s fun. Then again, I bought a custom New Orleans Pelicans jersey for my NBA 2K player (Chandemonium, baby), so who am I to talk. Real fans, on the other hand, are pissed! They want real players, not digital ones. Guys, the Spanish transfer window is open until August 31, there’s plenty of time to put a proper football player—maybe an Englishman who won’t live in his hotel the entire time—on the books.